Minimal art tends to emphasise the thingness of artefacts through the elimination of non-essential features to artworks. 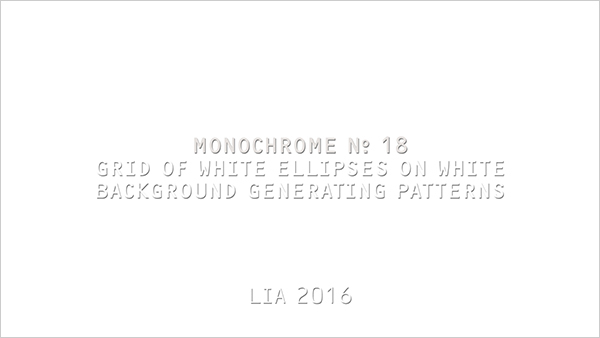 In this sense LIA’s works have always been minimal. However complex surface forms they may develop, they emerge from clear, often relatively simple processes, that iterate, are interacted with, and allowed to grow. In the late nineteenth century, precursors to monochrome painting proposed single color canvases with titles as Combat de Nègres dans un tunnel (Paul Bilhaud, 1882), or Première communion de jeunes filles chlorotiques par un temps de neige (Alphonse Allais, 1883), works that could be understood more as narrative experiments than as explorations of the limits of visual representation. Due to their titles, they were still representational, while pure abstraction has no subject matter. In the twentieth century, Kazimir Malevitch’s or Yves Klein’s monochrome paintings offered a wide range of possible interpretations, maybe even an absolute impossibility of interpretation. Their titles (as Black Square or White on white) objectively tried to avoid narrative construction, and any representation. They were developed through the exploration of a single variable (or mode) — color — willingly abdicating of everything else. Still, being physical artefacts, their thingness could be felt on the texture of brush strokes, in the paint, in crackles and small defects, in the ageing of canvas and paints, etc. Instead of simple artefacts, they became extremely complex artworks, allowing for long and detailed scrutiny, and leading to complex and rich aesthetic experiences. Color by itself can be a gateway to transcendental experience. By being reduced to a single field of color, in spite of extreme abstraction, these works become extremely concrete experiences. 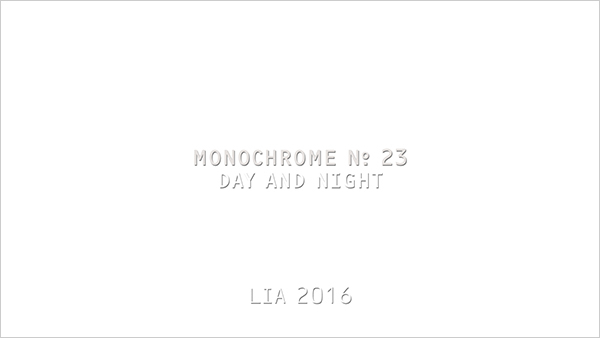 LIA’s Monochromes are clearly inscribed in this tradition of Malevich and Klein. 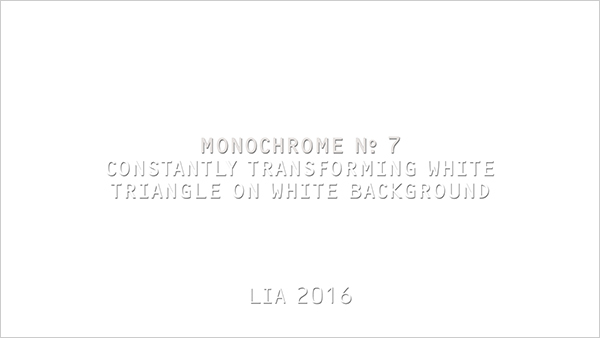 They are variable duration videos presenting little else than white pixels with no variations in lightness or any perceivable forms, thus they become as abstract and minimal as possible. 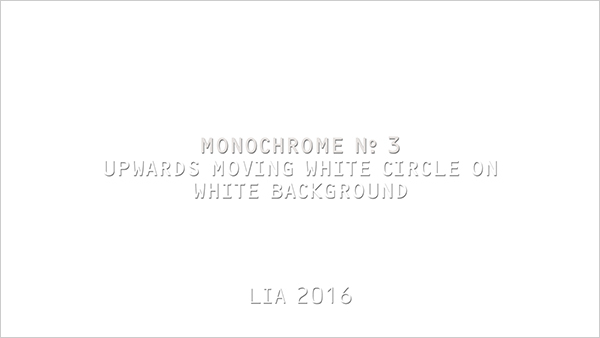 But LIA’s Monochromes bear titles as Upwards Moving White Circle on White Background (N. 3) or Grid of White Ellipses on White Background Generating Patterns (N. 18). Much as Malevich did with his titles, form and color are described, but something else is brought forward, the description of process. 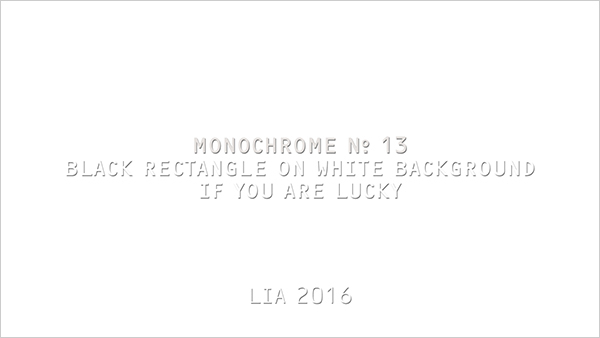 LIA’s works are normally deeply procedural. They are conceived and developed from procedural starting points, not from formal concepts, with behaviour and form emerging from coded processes. 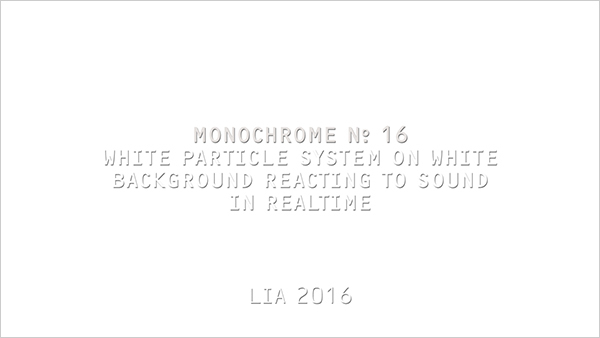 But LIA is usually not prone to detail the processes, rather leaving to the viewer or the interactor to develop their own hypothesis about them, derived from observation or interaction. We may thus discover a second intersection, with a tradition of artworks as John F. Simon Jr’s Every Icon, or Casey Reas’s Process series, where the processes developed and instantiated in the artwork are detailed to the viewer (as code, pseudo-code, or textual descriptions). Disclosing the process to the viewer may allow the minimisation of the effort needed to develop and test hypothesis about the work, to gather information and develop models that may allow one to understand the work and predict its behaviours. This shortcut allows the viewer to immediately focus on the aesthetics of the process  and how it causes the development of surface expressions. 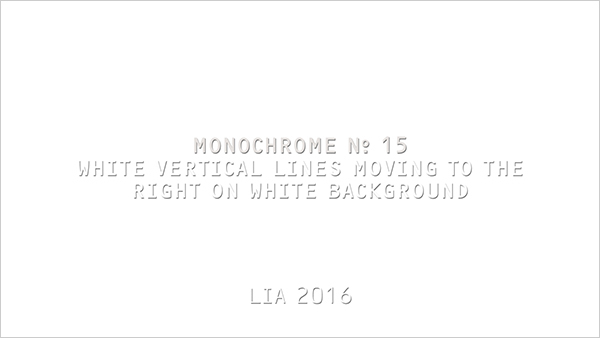 Primed by their titles, LIA’s Monochromes give the viewer a process, and they instantiate it, but being monochrome, the surface remains mostly invisible and undetectable. It is then left to the viewer to develop hypothesis about the process and which surface elements and behaviours they may lead to. These are presented, one assumes, but invisible as they are, they must be recreated in the mind’s eye. 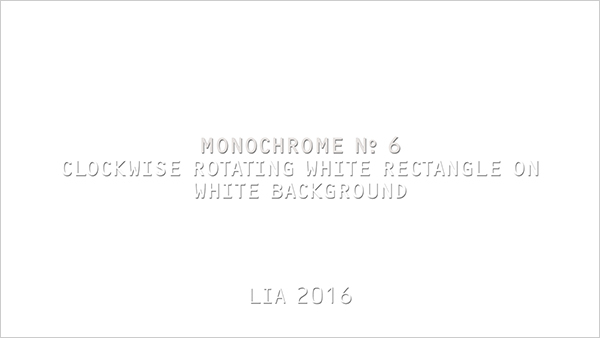 If there’s normally a simulation and verification attempt from the viewer of procedural works , LIA’s Monochromes take this to an extreme, not offering much besides a conceptual description of the process in the title. 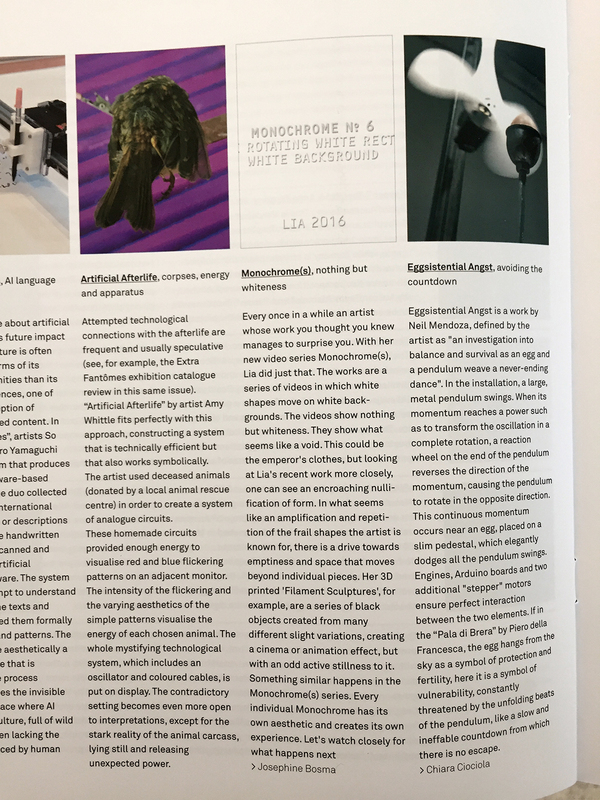 Abstract as they are, concrete as they become when presented as videos, they become notational artworks  that are simultaneously autographic (presented as videos that document singular runs of the code) and allographic (as scores for the viewer to simulate). Or even as puns, as the poet Bilhaud and the writer and humorist Allais were participating in painting exhibitions. The work’s deep units, or Frieder Nake’s subface. See Carvalhais, Miguel. Artificial Aesthetics: Creative Practices in Computational Art and Design. Porto: U.Porto Edições, 2016. Cf. Goodman, Nelson, Languages of Art, 1976.